How a gentleman should properly pose himself in a fake setting: Regarding the punch-line photograph of me from the 1970s, My Better Half writes: "Chris just told me, 'I still have those pants.' I desperately hope not, but it's at least possible. At least I'm always the better-dressed partner. Regards, His Wife." I was joking. 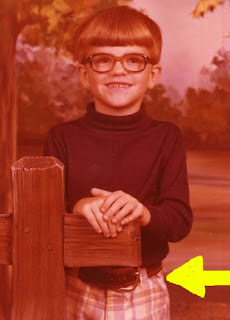 I no longer have those pants. And Joan is correct. She is always the better-dressed partner. But I'm getting better. I'll have this whole fashion thing licked by the time I'm 50. Postcrossing card from Germany: Hotel Astoria, Leipzig Central Station: It's pretty neat how this Postcrossing postcard spurred some other people's contributions and memories. "Hotel in Leipzig" writes: "Unfortunately this nice hotel in Leipzig [the former Hotel Astoria] has been closed for years. Many plans have been made out for re-opening. Today the plan is to make it a convention center which does not contain any hotel rooms anymore. The new concept is to rent out the convention rooms and facilities to the hotels and businesses surrounding the old Astoria building. Its location in the heart of downtown Leipzig makes this formal hotel in Leipzig [ideal] for the desired concept. Many people in Leipzig hope that this concept will be realized as quick as possible." "The Little Death" writes: "I'm from West Germany. Hope I remember it right. The thing was you order the car [the Trabant] when your child was born. So the child has a car when he or she is old enough to drive one." Caption contest: Win a bundle of vintage paper! A big thanks to everyone who participated. 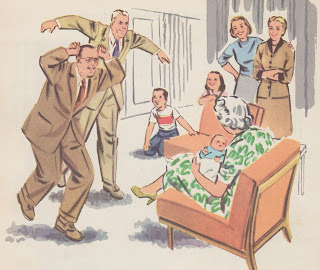 The winner was Bonnie Jeanne (aka PostMuse), who quipped: "Pick your friends well, Sweet Baby, because you sure can't pick your relatives." Birthday gift from the Class of 1943-44: Reader magx01, who blogs on The Thoughtful Gamers, writes: "I'm having a near psychedelic experience reading all of these! Incredible isn't it? I can log onto the internet in 2013 and look at a picture of a card that was pasted into a book seventy years ago by a group of people who no longer exist. Little did they know that a seemingly mundane, nondescript and unimportant moment in time would cast a reflection through the mesh of time to me here and now..."
Indeed, that is one of the things Papergreat is all about. Preserving and sharing these tiny shreds of history that would otherwise be lost forever. I present them here, and leave it up to everyone else (perhaps future Everyone Elses) to decide what has lasting meaning. Here's hoping that Pixlr is a cure for blogger's block: PostMuse writes: "Bloggers block happens to me in big bursts and I end up not writing for a few days or a week, once five months! And it means tons of rescheduling of posts and apologies to the people whose orphaned postcard didn't get featured when it was supposed to and I feel awful. Sometimes I'll just do what you did ... put up something different and fun ... and that works to remove the block. Sometimes I just need to take the break." Clearly, my Blogger's Block is a thing of the past, as I had 31 posts last week thanks to the Postcard Blogathon. PostMuse, by the way, contributed some wonderful comments during the Blogathon, and I'll be rounding those up in a separate post later this week. Old notebook documenting trips to the general store: Anonymous writes: "Um ... notions are items used for sewing. Thread, ribbons, braid, needles, etc." Well, NOW I know that. Clearly, I did not when I originally wrote that post. I still like the notion of a notepad for my kind of notions, though. Cheerful Card Company can help you earn extra money for the holidays: Anonymous writes: "I remember when I was a youngster seeing the above ad in a magazine and sending for the kit to sell greeting cards. I do not remember how much I earned. That had to be 50 years ago. I am now going to be 66. What a happy memory." And thanks for sharing that memory! 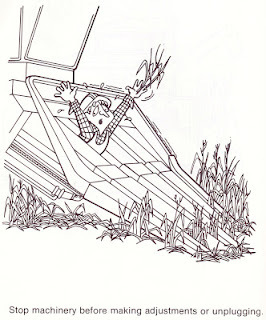 "Safety on the Farm" — a nightmarish coloring book for kids: PostMuse writes: "Nightmarish indeed! And the book asks kids to draw a picture of a farm accident at the very end ... I'm guessing the kids who got this book also ran out of red crayon." Obscure nostalgia: 1970s plastic mugs from Whirley Industries: Lee Shearer writes: "I have one with a frog smiling on it." Isaac Wilson: The photographer? The homeowner? Or both? Anonymous writes: "Isaac Wilson built the house in the photograph in the 1940's and also took this photograph of his house." Wow. This is a situation in which I wish the reader commenting wasn't anonymous. If you're out there and can share some more about how you know this, please do! Thanks. 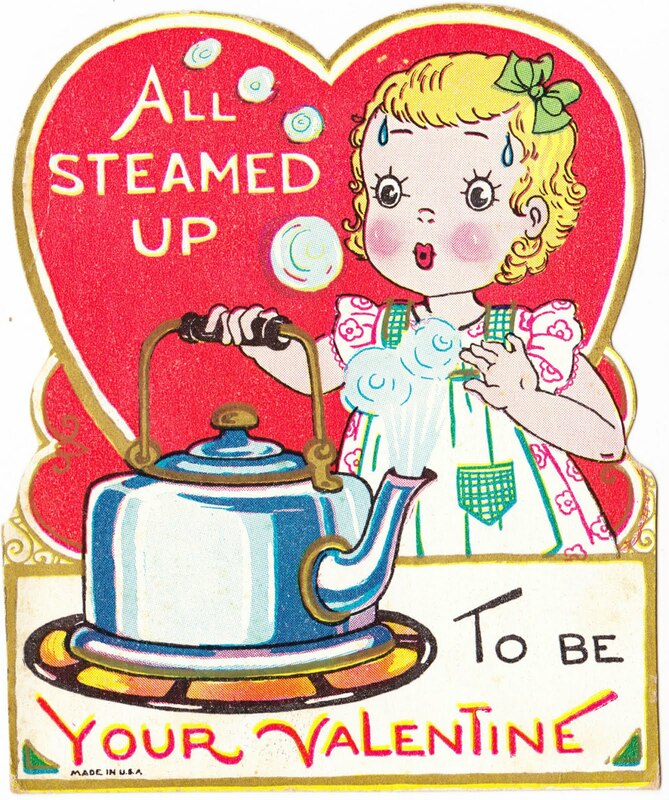 Three vintage Valentine's Day cards: Venus Fortuna, whose blogs include Inkpressive Invitations, Write The Invite and Sisters Craft Café, writes: "Hi! 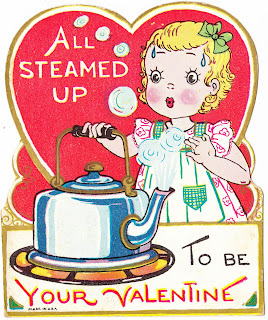 I downloaded the Steamed Up card, it is so cute, I'm using it for my little girl's 1st birthday party - it's going to be a Valentine's Day themed party." Glad you can make use of it! As a side note, one of the "finds" that my wife and I made on our recent eighth wedding anniversary trip through central Pennsylvania was a gaggle of vintage Valentines. You'll definitely be seeing them here next February. haha! I came back to this site to look for more Valentine's day post cards, and viola! I'm already reading my name! Thank you for the mention. Nice blog!